Thank you for your interest in dining at our Pepe's Mexican Restaurants. I hope that I can provide you with the information that you need so that you can enjoy the food at Pepe's. 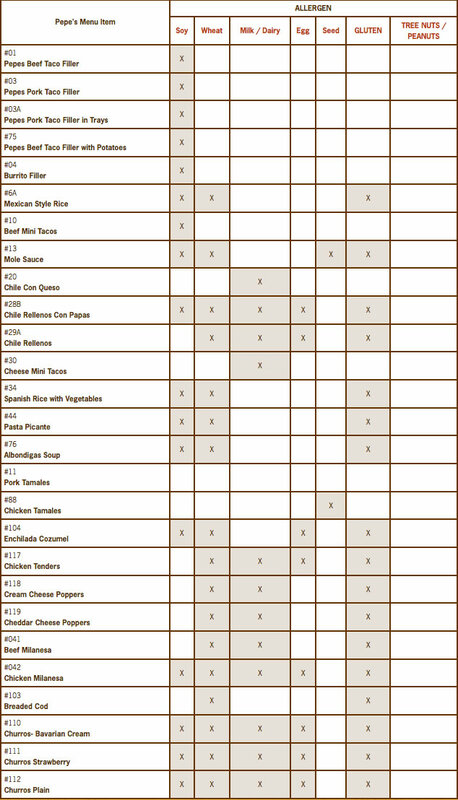 I am attaching a list of products with allergens and gluten that will help you make the correct menu choices at Pepe's. Please remember that depending on how sensitive you are, there are a good many hidden sources of gluten such as modified starch, hydrolyzed protein, extracts, flavorings, preservatives, etc. Incidental contamination can occur during food preparation from the grills, inserts, utensils, cutting boards, and frying oils. Also, Pepes Incorporated cannot assume any responsibilty for alterations or modifications to products at the restaurant level. When ordering, the simpler is better. Avoid flour tortillas and order broiled meats. Again, thank you for your interest. Please bear in mind that product recipes change, modifcations occur and kitchen circumstances dictate changes from time to time, depending on supply, season, pricing, manpower, etc. For this reason, information that may be accurate today may not be true tomorrow. For this and for many other reasons, you should consume any seemingly gluten-free food item with caution. We cannot assume liabilities for any inaccuracies that may occur. If you need futher allergen information, please contact us. * Please note that some menu items are NOT available at all Pepe's locations.